Radiant & Refreshed. Daytime. Nighttime. All-the-time. + Dispense half a pump to the applicator tip and dot around both eyes. Smooth product over the entire orbital region ensuring even coverage from undereye to brow, including eyelids. Blend with fingertips for a seamless finish. Reapply throughout the day, as desired, for a quick refresh. + Remove makeup, cleanse, and dry skin prior to applying Total Eye™ Concentrate. Shake lightly before use to activate. Glide the rollerball along the upper and lower eye contours from inner to outer corner. Repeat until area is well-saturated. Use fingertips to gently pat into skin. 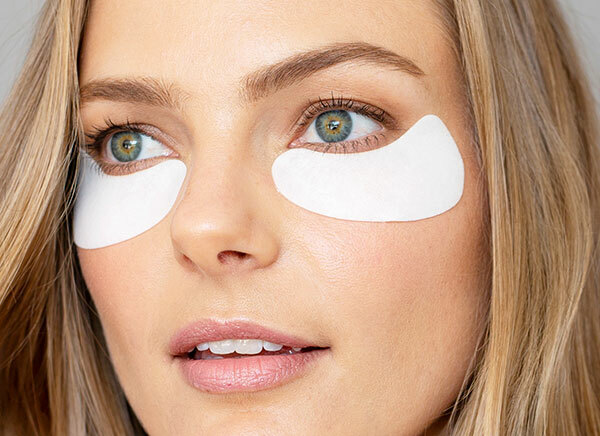 + Apply Total Eye™ Concentrate onto clean skin, then apply eye masks to undereye, starting from inner corner and extending to outer eye area, making sure to leave some space below the lash line. Leave on for at least 10 minutes. Are the Treatment Masks and the Total Eye Concentrate available for purchase separately? At the moment, the Treatment Masks and Total Eye Concentrate are available only as part of this kit, to provide a 24/7 approach to address the eye area. 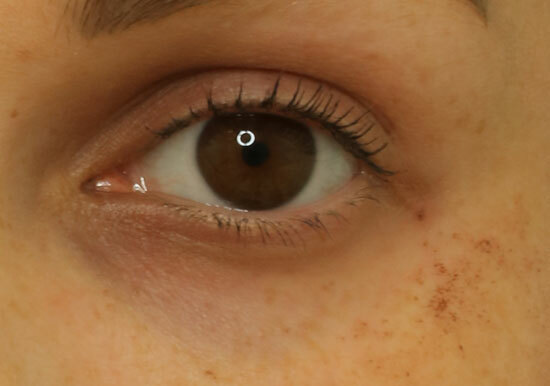 Can I apply other eye treatment creams/products on top of Total Eye Concentrate? Yes. If you choose to use another eye cream on top of Total Eye Concentrate, apply the Concentrate first, allow it to time to sink into the skin and dry, and then apply the other treatment products. Can I use the Total Eye 3-in-1 Renewal Therapy SPF 35 at nighttime even though it says it is for daytime protection? Yes, the product is safe to use at nighttime as well. If using in conjunction with the Total Eye Concentrate at night, apply the Concentrate first, allow to dry, and then apply Total Eye 3-in-1 Renewal Therapy SPF 35. Can I use the Total Eye Concentrate in the morning? Yes. The Total Eye Concentrate can be used in the AM as well. If you choose to do this, apply the Total Eye Concentrate first, allow it to dry, and then apply Total Eye 3-in-1 SPF 35 to ensure protection. Can I use Total Eye™ products around the mouth or any other part of the face? Total Eye™ products are safe to use around the mouth or any part of the face, however, keep in mind the ingredients were selected for optimum results specifically for the eye area. 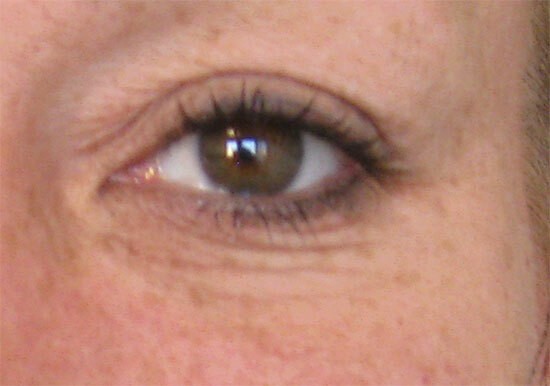 Can Total Eye™ 3-in-1 Renewal Therapy SPF 35 be worn as a primer under my eye makeup for sun protection? Total Eye™ 3-in-1 Renewal Therapy SPF 35 preps the skin for smooth application of makeup so it can be worn as a primer. Do I need to use other eye treatment products while using this regimen? Total Eye™ Restore Regimen addresses the visible signs of skin aging, including depuffing, hydrating, correcting dark circles, fine lines and wrinkles, crow’s feet, and improving skin laxity, therefore other eye treatment products are not necessary. 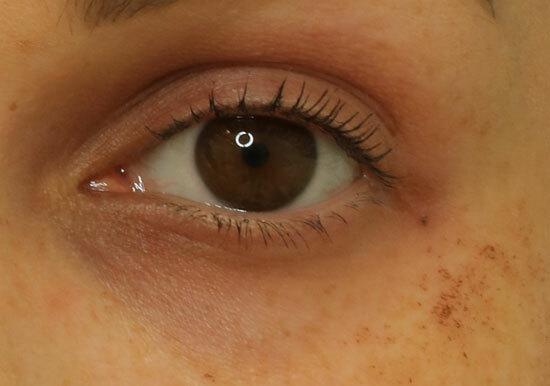 Does Total Eye help with hemosiderin staining under the eyes? 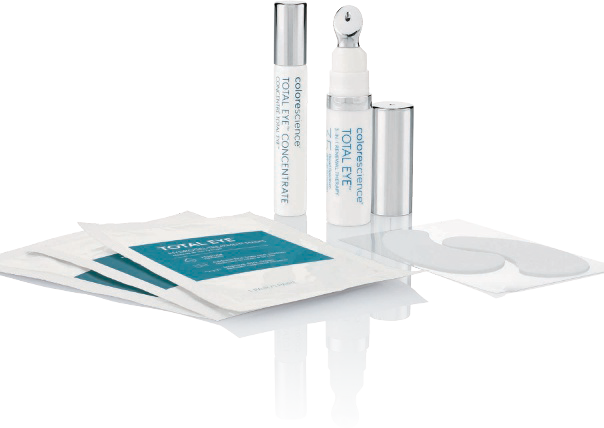 Total Eye is comprised of a unique ingredient complex which works to help improve the appearance of fine lines, skin laxity, puffiness and dark circles around the eye area. There can be a variety of underlying causes for these concerns, therefore results will vary. 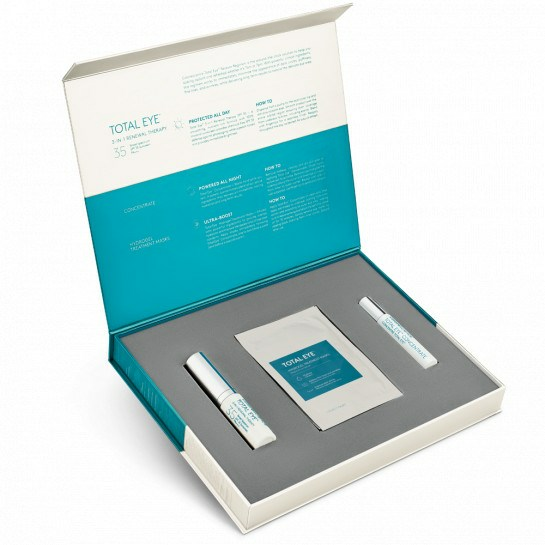 The Total Eye Restore Regimen kit should last 6-12 weeks depending on usage. How much of the Total Eye Concentrate should I use? 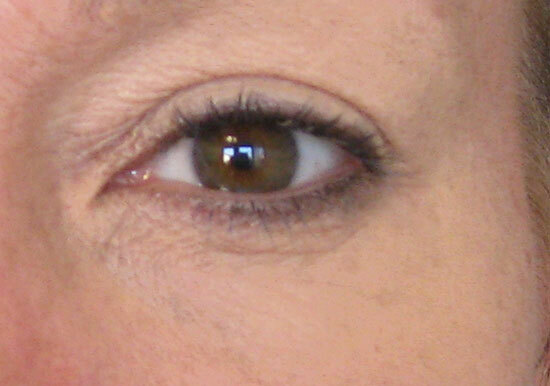 Begin with rolling 2-4 times back and forth or until the entire area below and around the eyes is fully saturated. You can reapply as needed. Is Total Eye Restore Regimen free of animal testing? Total Eye™ Restore Regimen products have not been tested on animals. In addition, all Colorescience® products are also 100% free from animal testing. Is Total Eye Restore Regimen non-comedogenic? 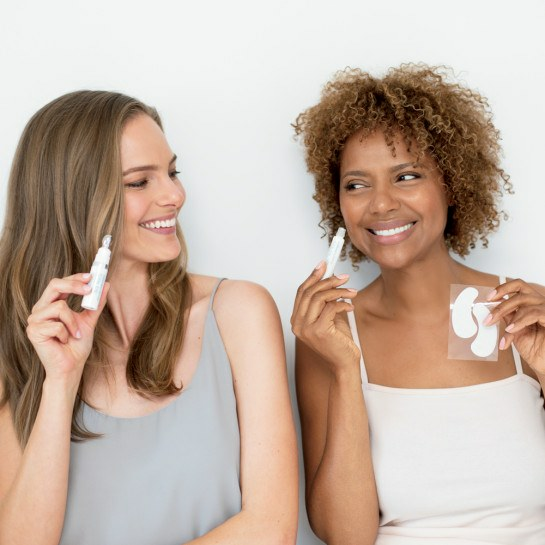 While the products in the kit are ophthalmologist tested for safe for use in the eye area and contact lens wearers, they have not been tested for non-comedogenicity. Is Total Eye Restore Regimen oil free? Total Eye™ Restore Regimen products are oil free. In addition, all Colorescience® products are also 100% free from phthalates, synthetic fragrance, animal testing, talc, dyes, mineral oils, drying alcohols & chemical sunscreen. Is Total Eye Restore Regimen paraben free? Yes, Total Eye™ Restore Regimen products have been formulated without parabens. In addition, all Colorescience® products are also 100% free from phthalates, synthetic fragrance, animal testing, talc, dyes, mineral oils, drying alcohols & chemical sunscreen. Is Total Eye Restore Regimen sulfate free? Total Eye™ Restore Regimen products are sulfate free. In addition, all Colorescience® products are also 100% free from phthalates, synthetic fragrance, animal testing, talc, dyes, mineral oils, drying alcohols & chemical sunscreen. 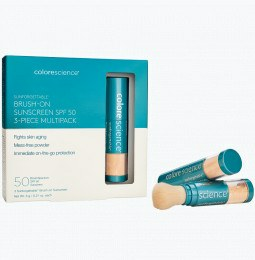 Is Total Eye™ 3-in-1 Renewal Therapy SPF 35 a treatment product or a concealer? 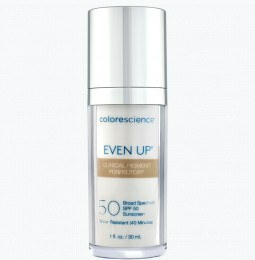 Do I need to wear an additional concealer in addition to Total Eye™ 3-in-1 Renewal Therapy SPF 35? Total Eye™ 3-in-1 Renewal Therapy SPF 35 is a treatment product for the eye area with the additional benefits of SPF 35 protection and color correction. It contains a neutral peach color that provides immediate color-correction for dark circles and brightening of the eye area. This expertly blended shade is intended to neutralize most of the reds, blues and browns found around the eye. For some, this correction will be enough. 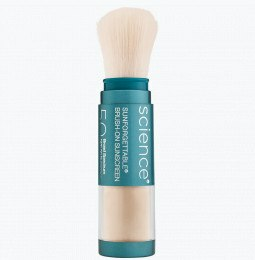 For others that need more concealment, we recommend the use of our Mineral Corrector Palette SPF 20 after/on top of Total Eye™ 3-in-1 Renewal Therapy SPF 35. What is the difference in ingredients between Total Eye 3-in-1 Renewal Therapy SPF 35 and Total Eye Concentrate? Total Eye 3-in-1 Renewal Therapy SPF 35 contains immediate color corrective ingredients as well as SPF 35 protection, while Total Eye Concentrate does not have a color component or SPF. 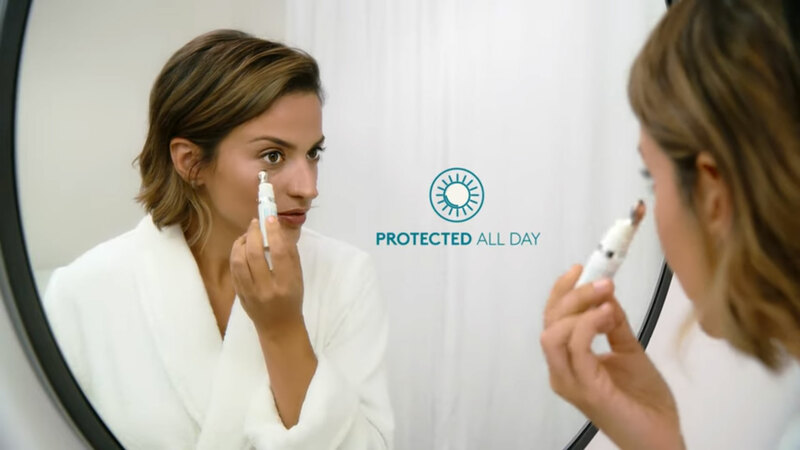 The specialty ingredients in Total Eye 3-in-1 Renewal Therapy SPF 35 are present in Total Eye Concentrate at efficacious levels, with an extra 3 times the amount of Aldavine 5x, and 5 times the amount of Phytomoist found in Total Eye 3-in-1 Renewal Therapy SPF 35 for extra potency against dark circles, puffiness, and dryness. 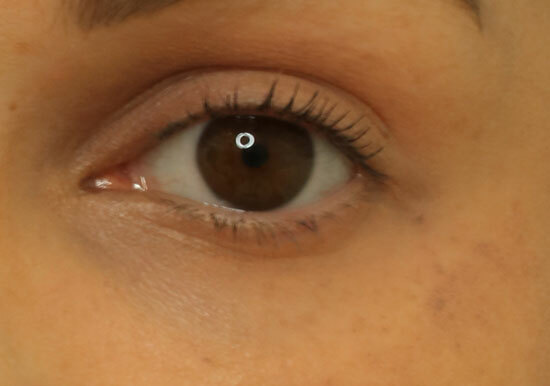 What should I do if my Total Eye Concentrate dry-rolls and it seems like the product isn’t coming out? Give the vial a good shake to activate, then ensure you are holding the product at a 45° angle as you apply. Which end of the Hydrogel Treatment Masks goes closest to my nose? The narrower end of the mask goes closer to the nose, this is to allow the larger part to cover more surface area where crow’s feet and fine lines tend to appear. Is Total Eye Restore Regimen gluten free? Yes, Total Eye™ Restore Regimen products are gluten free. People who have gluten allergies may experience sensitivity when using topical products. Total Eye™ Restore Regimen is gluten free, and therefore, safe for those with Celiac disease. In addition, all Colorescience® products are 100% free from parabens, phthalates, synthetic fragrance, animal testing, talc, dyes, mineral oils, drying alcohols & chemical sunscreen. Love this product it helps cover my circles under my eyes!! This is so relaxing and I saw immediate results! This is a great product! A little goes a long way!! Total Eye is awesome. Great product that works. Total Eye is the first eye product I've ever used that lives up to all its promises -- brightens, smooths, protects and more. The new concentrate is also powerful for my crepe-like under eye area, dark circles and more. And the ultra boost is truly amazing!